RockUnited already witnessed Kamelot in Sweden Rock 2003 with an excellent show. This easter took us around in Europe, where the team of three people witnessed two shows from the three bands. Kamelot's tour consisted of 18 shows and started 18th of March from Madrid, Spain, concluding to Athens, Greece, on 9th of April. They also played in Belgium, France, Netherlands, Italy, Switzerland and Germany, the last two having shows we saw. The bands didn't just hit a country once, but were jumping from one to another for a gig there, another one elsewhere. Quite a puzzle, but lucky for them the borders of each country are quite near. Driving between the two show sites we gathered some 1000 kilometres, but that included sightseeing as well, we dropped by in Strasbourg, France and other cities in Germany. We started blasting with the new album from Kamelot already in the beginning of the journey, "The Black Halo". On a cloudy, but warm day with the green grass and flowers blooming, we headed towards a nice town called Speyer. It's something else here in March comparing to the snowy Finland still holding minus temperatures. Having just two days earlier purchasing the Kamelot cd there wasn't much time to get to know the new songs before the first show. First show for us of course. It turned out to be a surprisingly short ride to the first gig place, but then again we drove like everyone else, the average speed being around 160 km/h. No wonder you reach places fast, when you can drive that fast. In Finland the highest speed limit is 120, and that seemed like nothing in Germany. After leaving our stuff to the hotel which situated some 15 minutes walk from the Halle 101, we went for a walk to find out where the show was going to be. Speyer offers museums, Imax-theater, Sealife and lots of other things for a visitor, but we didn't have time for any of those. Some of the planes from the technical museum are seen outside and it's an impressive sight. After a walk by the strongly drifting river Rhine (or Rhein in German), suddenly two longhaired guys appeared before us. Being sure they'd lead us to the venue, we started tailing them. "But wait a minute, these guys look way familiar ! ", we shared a thought. And as funny as it was, it was no one else but Kotipelto and his bassist Porra. We decided to give them a scare and hid behind some bushes, finally reaching them at the venue gate. Kotipelto seemed surprised, referring something to idiots. Oh, thank you very much. Us birdbrains accompanied him in and already some fans were outside waiting to meet the bands and get a few photos. Some Japanese travelled the same route as we. Kotipelto had his soundcheck and the guys were giving us a few laughs while at it. Porra decided to take a walk around the venue while playing. Kotipelto sang something sticking out of his repertoire, "Can't Help Falling In Love" by Elvis. After the soundcheck it was Epica's turn and the members seemed to be in a good mood anytime. We started getting ready for the evening, it was still couple of hours for showtime. At around seven the place which holds around 1200 people, was packed and it was hot inside, even the backstage rooms for bands were somewhere near sauna temperatures, but the bands were pleased they didn't have to shiver there. But even from the hot atmosphere most people still kept their jackets on and many came by car even when it was Friday night. The schedules kept and Epica kicked of the evening at eight. Not being familiar with their music, they seemed to be a cross between Nightwish and the earlier Amorphis with growling vocals. After all, their singer Simone Simons sings like Tarja Turunen and their other guitarist Mark Jansen does the grunts. There's oriental influences in their melodical music, but the pompous classical influences are the strongest element in the songs, which aren't the easiest to get into. Halle 101 was filled with Kamelot fans for most part, but Epica got a nice response too. They played a loud set as the rest of the bands, around 35 minutes, with air fans cooling them down on the hot stage. That was needed indeed, since the band was very lively. Kamelot- guys were also seen watching the show. At nine o'clock it was Kotipelto's turn to take the stage and Ennio Morricone's western-tune made their entrance. The sounds were good for each band. Kotipelto's band was very interesting, each member has a background from different musical genres. Mikko Kaakkuriniemi usually plays drums in the jazz/soul/groove band Quintessence, the very energetic Robert Engstrand comes from the progressive The Flower Kings, Tuomas Wäinölä has a colourful background from different genres including finnish entertainment bands and Lauri Porra has played prog rock and metal and sang in an academic choir. To say the least, these shows were going to be very interesting. But the band did well on both nights, though Mikko was complaining about his legs getting tired from all the fast songs that he's not used to playing. There were some small mishaps with the bands, but they pulled the shows through well enough. 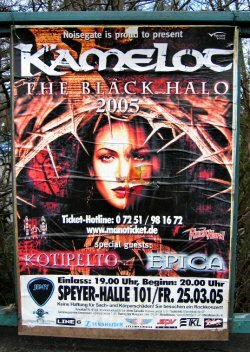 The sets didn't change much, though in some shows Kotipelto and Epica switched places. 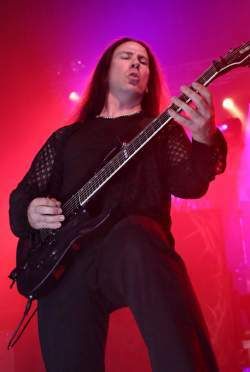 These shows were among the best from Kotipelto and of course he played some Stratovarius songs as well. I visited Kamelot's room before they went on stage and had a quick chat with Thomas Youngblood (guitar) and Casey Grillo (drums). The guys were really relaxed, even reading books in the unbearable heat. Casey let me in on some interesting facts about himself, having a finnish girlfriend years ago and playing in a ferry between Finland and Sweden. who would've guessed from a metal drummer and someone all the way from US. But now he's even auditioned for the role of legendary drummer Buddy Rich, so the best of luck to him. Wonder what he's up to next...You can read other interesting facts from the interview I did with Thomas in Pratteln. It was past ten o'clock when the guys went on stage and finally the crowd was starting to wake up. 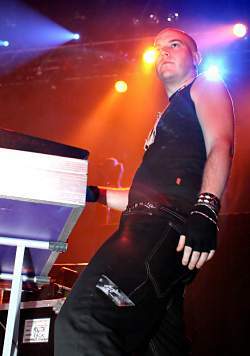 "Center Of The Universe" was the first song with their female vocalist, continuing with "The Black Halo", "The Edge Of Paradise" where Roy Khan climbed on top of the monitor, "The Shadow Of Uther", "Nights Of Arabia", "Wander", "The Haunting" with Simone from Epica joining in as she does on the particular video, keyboard solo, "Forever", then some crowd singing, "Soul Society", "Don't You Cry" where Roy yet again climbed but this time to one of the piles that are on the other side of the hall. He went all the way up and just hung there singing. It looked frightening since he could've fallen down. When the song was almost through he was escorted back on stage and it was time for the band introduction, then drum solo, "When The Lights Are Down", "Karma" and the encores; "March Of Mephisto" where Mark from Epica sang the parts of Shagrath and finally "Farewell", a strange pick for last song, though the title suites for that. The set lasted about an hour and a half. 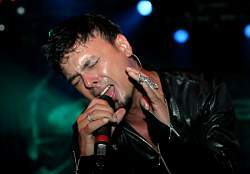 Kamelot wasn't able to play longer, since Khan had a sore throat and was sipping tea from time to time. But he still did quite good, the higher parts weren't for him tonight. There was some flu going on, Wäinölä was also sick. His face was all red sometime during the evening. The sets changed each evening because of Khan's condition, but the two shows were almost similar. The show ended before midnight, but the night wasn't the least bit over for the bands. They still continued partying, first at the messy backstage, where Simone after brushing her teeth decided to sing a tune for Kotipelto, his own song ! Timo seemed a bit bothered, but Simone sang well. Porra showed us some footage of the amazingly strong Mikko, the guys explained he can even lift a car ! Being really full from the large drinks Timo got some from me, but I had no idea we were still going places, and more drinks were waiting. The bar right next to the concert venue, Flaming Star, was waiting. Its interiors are in 60'ies style. Cool looking place, but the music wasn't metal. The bunch still stayed there till the closing time. Members from all the bands were there, everyone sitting in their own tables. A shy girl came and asked for Timo's autograph on her own photo, which turned out to be taken by Kari. It was printed straight from the official Stratovarius pages. The world seems so small with the Internet. When the table is full of men, the conversations often turn into cars. Or this time to bikes. After what seemed to be an ordinary evening out, we headed to sleep, but some of the guys kept partying till eight. Wonder what they did up that late ?! They never said...Little did we know what was to happen next evening in Pratteln. At around nine o'clock we woke up to a headache, feeling like a roadkill and our clothes stinking from the smoke last night so much, that throwing up was close when smelling them. We got up immediately, 'cos some local sights and whatever came across was waiting, while heading to the next showplace. Speyer was having a warm Saturday weather bringing people outside in masses. There were nuns everywhere with flowers. Couldn't avoid people's stares while gazing the churches along the way, all dressed in black, making noise from being tired from last night, laughing at the most silliest things. An expensive and tasteless breakfast kickstarted our day. Karlsruhe was the next big stop for some cd stores. The never-ending busy street had all kinds of shops with the latest fashion. Burger King's got the best veggie burgers on the planet, too bad Finland doesn't have one anymore. Strasbourg in France was next to our route and turned out to be a really idyllic place, which had the most beautiful church we've ever seen. Still couldn't stop laughing though while sightseeing. Wrong day for churches. The river Rhein followed our route and a lot of swans embellished the otherwise grey spring scenery along it. It was about thirty minute drive from Strasbourg to Pratteln and around seven p.m. we reached our hotel on the industrial area of Pratteln. The gig was held at Z7, right around the next corner. Our hotelroom was cheap, mostly meant for backpackers, but still had a shower and a toilet without a lock, both in small closets. It was fine for one night and it was also fine for Kamelot, who had rooms only for showering. Ahh, the benefits of headlining. Had a few laughs with Kamelot about the small rooms. The other bands showered in the backstage, which was messy anywhere you looked at. After getting some local cash, since Switzerland isn't part of EU, we headed to Z7. It was already packed and looked comfy for a concert place, huge mirrors on each side with two bars. We went backstage and after hellos it was time to do the Kamelot interview with Thomas. Near the end of it Epica went on stage so it was time to end our discussion from the noise. Epica's set seemed to be the same as the night before, but this time the crowd was more into them. The two shows opened only a few songs for me, they were the most catchiest ones in the set. Throughout the evening it was cruising between the bar, backstage and the show. 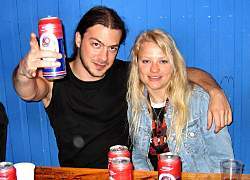 The drinks were really expensive like in Speyer, but the guys had no problem getting drunk from the free beer backstage. Kotipelto's black strong alcohol disappeared in his own throat, could've had some of that, but he was fast. Kotipelto played a bit shorter set this night, due to Khan's better throat. The crowd warmed up slowly to his set and the band played well again. Wäinölä played amazing guitar solos and so did Porra with his bass. The rest of the band were energetic also and the set sounded good. 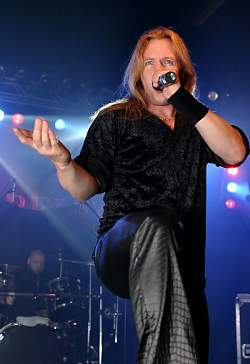 The songs were "Seeds Of Sorrow", "Lord Of Eternity", "Coldness Of My Mind", "Waiting For The Dawn", then guitar solo and Timo thanked the crowd in several languages, "Can You Hear The Sound", "Take Me Away", bass solo, "Hunting High And Low" from Stratovarius, "Reasons" and finally Timo explained some backgrounds to the next song "I've been singing this song in this place before like four times and it's about colours. 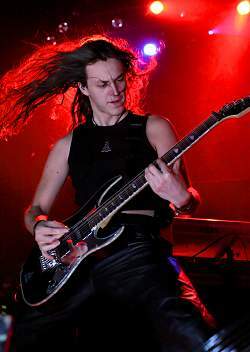 It's not about yellow or blue...", it was time for "Black Diamond" from Stratovarius. When the set was over he had to get some noise from the crowd. They did fairly good job. Most of my attention went to recording the sets both night on Kotipelto's camera, so the shows were somewhat hazy to me. Backstage Timo and the guys were running around in towels after showering and speaking dirty, what else. A little waltz was danced with Mark from Epica, since the club played some strange background music. We had to fool around with that. Kamelot was in a rush getting ready for their set and after some furious rattling on the bench where I desperately tried sending out messages to buddies, Casey was ready to go on. Later while wondering the fact that drummers are so energetic, he mentioned back at school he was a runner. Sounds like a fairytale a musician came up with, but Casey's still in great fit. As Kamelot started their set, the decibel meter on the clubs wall showed 108. It still increased a bit from that. This night their set only changed from the end, it included " The Inquisitor" and only then "When The Lights Are Down", then switching songs places, "March Of Mephisto" was first tonight, then "Karma" and a treat for Pratteln fans, the Japanese bonus track "Epilogue", which was a mellow, emotional tune. "Farewell" closed the set again. Watched a bit of "Wander" with Mikko backstage where he admitted Kamelot's music had started growing on him while on tour. I was impressed Kamelot did my favourite song yet again. And as before, Roy had to climb somewhere, this time it was the huge monitor on the other side of the stage, and the members of Epica joined the show. All the three bands are quite lively on stage and Khan always has a trick up his sleeve. All of them had their own fans in the shows, who hardly got excited when their favourite wasn't playing. Both nights sounded good, though Speyer was louder. Epica collects attention through their female vocalist, but no wonder, Simone is beautiful with a gifted voice. When comparing the vocalists, Simone offered soul food for guys, but her moves weren't nothing new when comparing what Tarja Turunen has been doing for almost ten years. 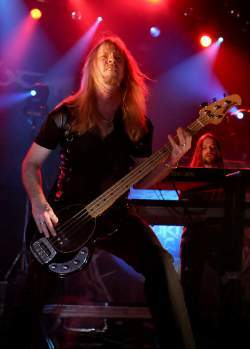 Kotipelto instead spoke the most between songs and Khan in his tight outfit divides opinions and makes some blood boil in the Epica-message board. His better half on stage raises emotions too, but she did her parts well and is good prop for the show in her beautiful dresses. Using the Epica members brings good plus for the show too. The conversations were more colourful backstage tonight than the night before. Some gross on-the-road bunk stories were told, then usual talk about cars, Florida music scene and the fauna, who's got the most hideous accident story. Everyone had a juicy story to tell. Wäinölä was feeling really energetic, lifting a marble table and getting other guys to show their strength. Then was time for some push-ups, even with one hand, some crazy running stunt, but the most hilarious thing he came up with involved an unnamed dirty sock and beer. This man was way different than in Wacken 7 months ago. Kamelot-guys were just laughing and shaking their heads to crazy finns. The booze disappeared fast in good company and at one point some guys bursted out singing '80ies metal tunes, quite out of tune since they were damn drunk, but Wäinölä was shining. Probably the only guy who was still able to sing from the drunken bunch, since Kotipelto wasn't joining in. As the clock turned four a.m., and we were still in winter time, it was time to leave. Saying goodbye to the nice fellows was tough. After lots of hugs and kisses where even Yves "Evil-Eve" Huts dared for a hug after the horrid stories of stiff finns, Kamelot went in their own tourbus, but before that asked us to join for the rest of the shows, which wasn't possible. 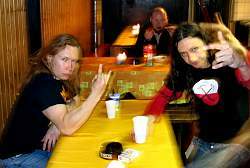 Epica and Kotipelto shared a buss together and it was crowded ! Thomas might've stayed up for some time missing his little girl, but the finns looked like they'd soon start dropping like flies. We walked into the dark and rainy night, scaring our friend already sleeping in the hotel, eye-balling us like aliens, then crashing to bed. And then it hit us, coming right from the upper bunk, the gruesome noise of Pratteln Chainsaw Massacre. I only slept two hours that night, laughing madly or cursing away the night at my noisy friend. Thanks to Kotipelto and the Kamelot crew for making this happen and all the bands and tour crew for awesome company.